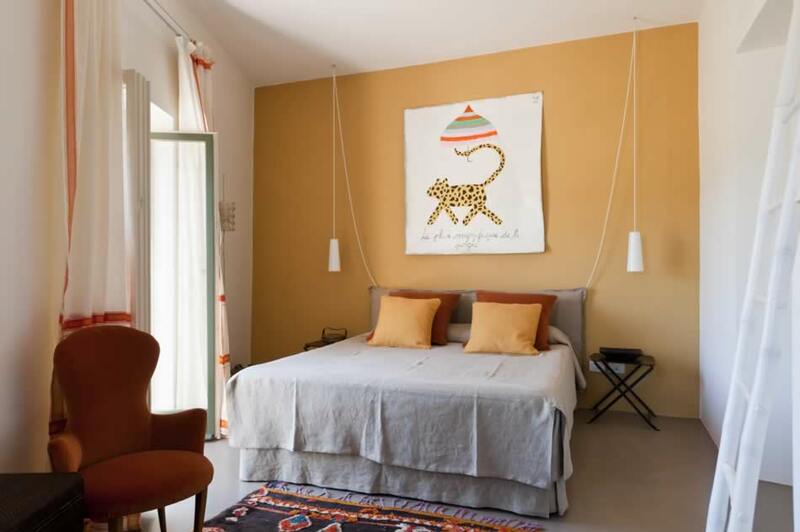 A few steps up the cobblestone street from Villa Buonanotte Barbanera is a charming guest cottage re-designed in a fresh contemporary style. 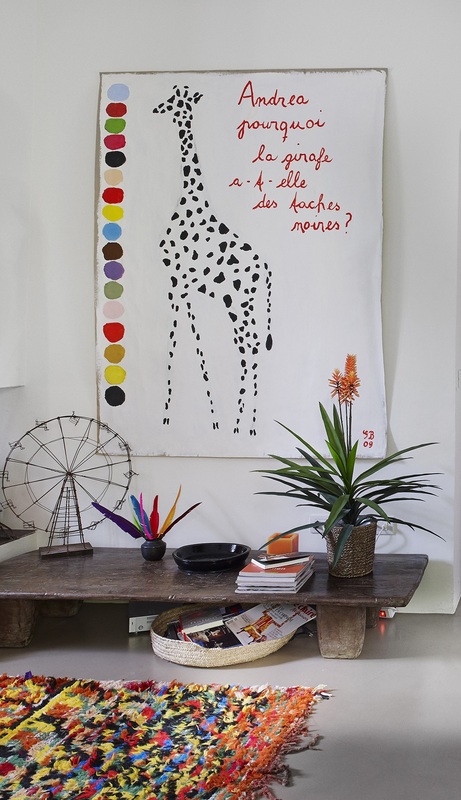 I have created a home-away-from-home using my favourite colour palette and objects found on my travels. 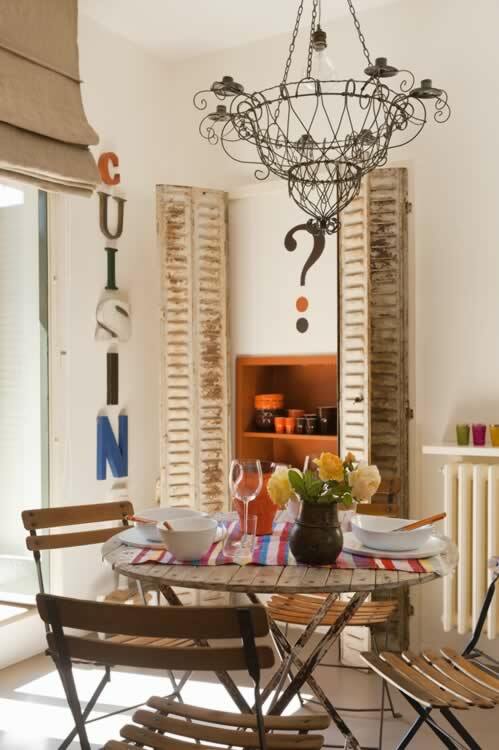 The Casetta is available for a minimum of three nights and fully equipped for longer stays. 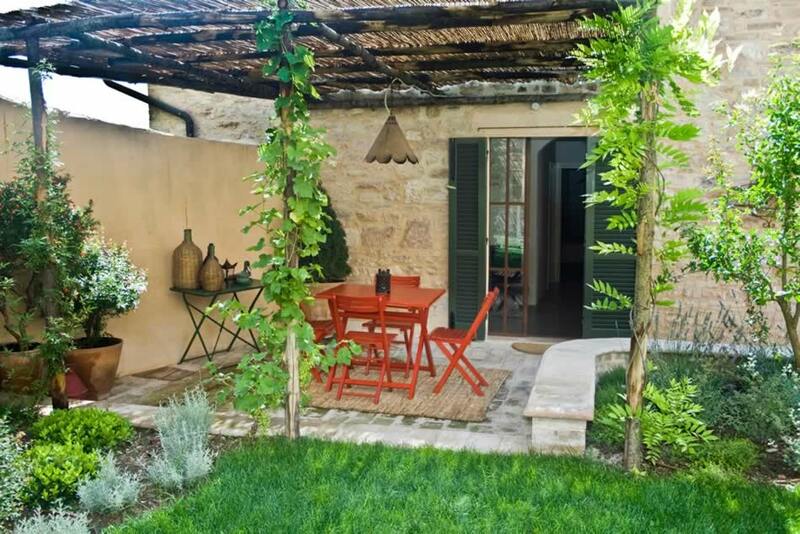 It is also ideal as extra accommodation for a larger party taking the Villa or Casa Giardino. 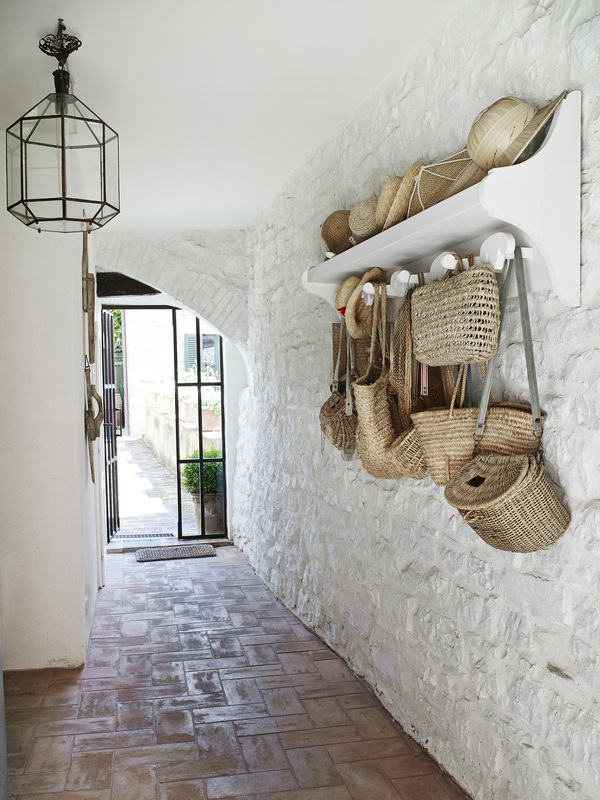 Open the door and a stylish stone lobby sets the scene. 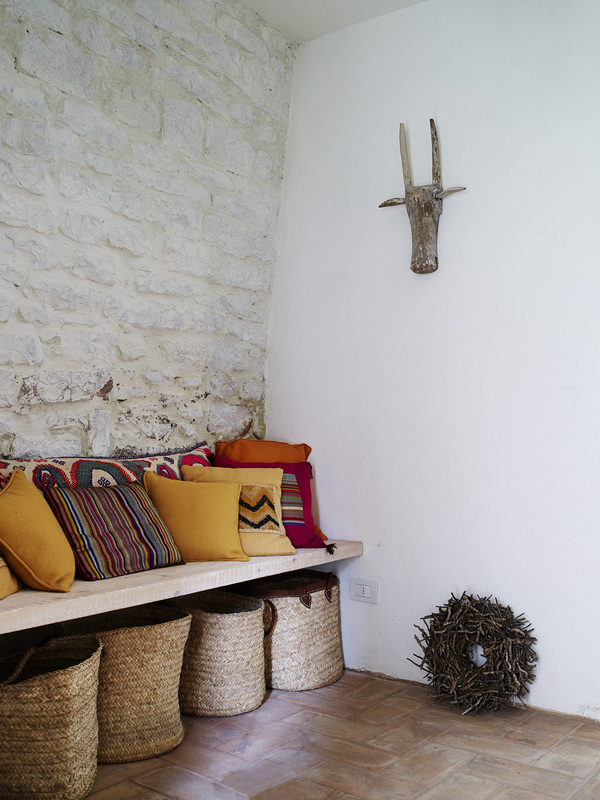 Bright Moroccan mementos add a dash of colour and a collection of practical shopping baskets is lined up under a bench. Your eye is drawn along a stone path and raised flowerbeds to a spacious garden. 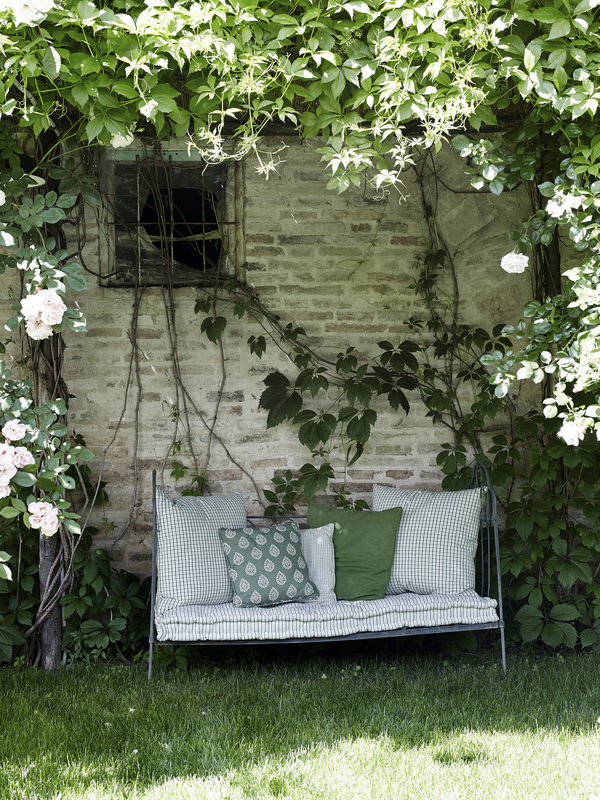 Umbria has excellent climate, and dining or resting en plein air is one of our greatest holiday pleasures – especially after a long day exploring the region. 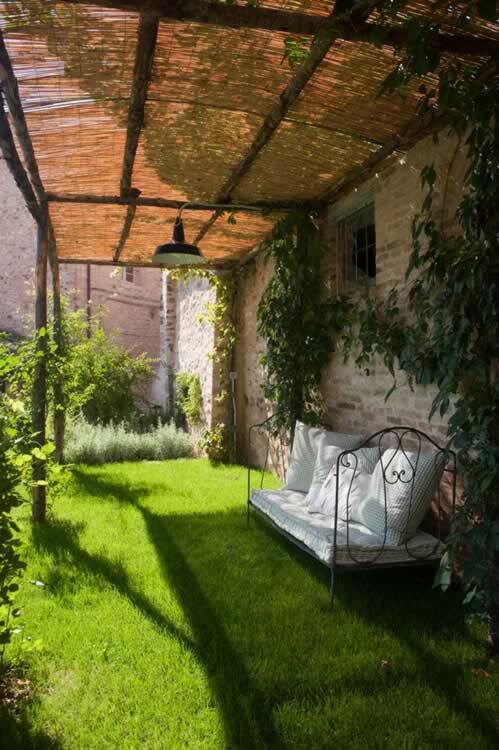 Recline in the shade of a tree or under the pergola on a day bed piled with soft pillows. 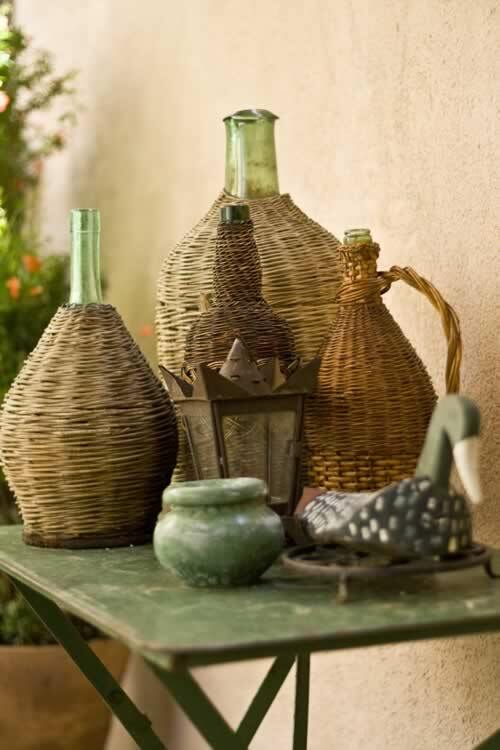 Enjoy a glass of local wine on the terrace. For many people the most vivid holiday memories are those of warm evenings spent with family or friends in a scented garden. 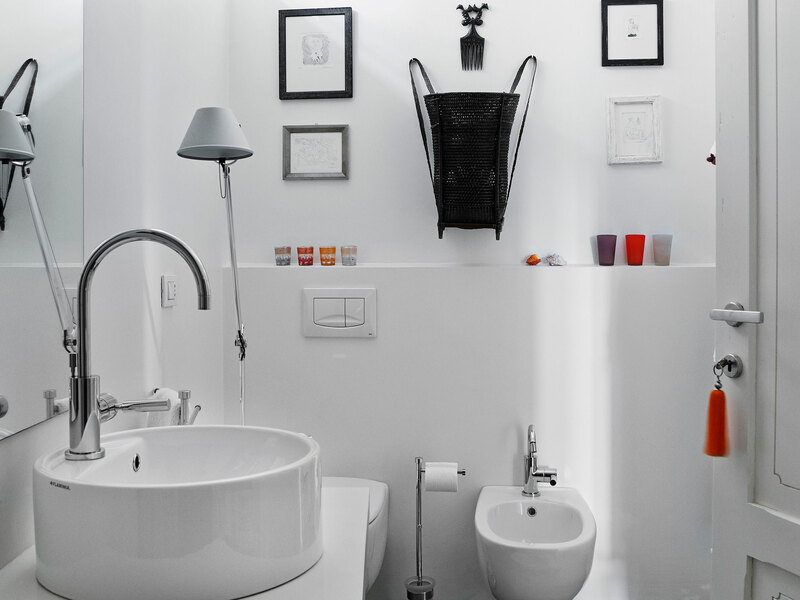 The Casetta welcomes you with a light and airy open-plan space. 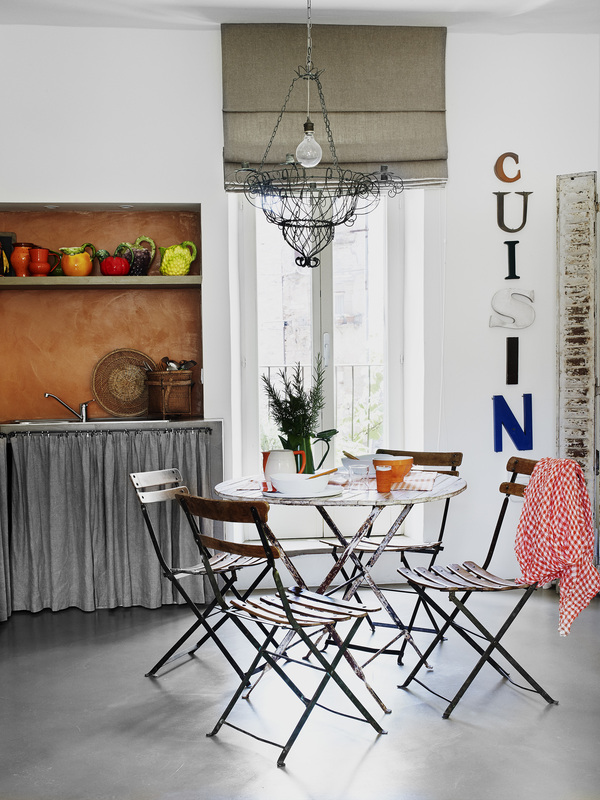 On one side is the kitchen and dining area, on the other a linen-covered sofa facing a fireplace. The floors are of soft, taupe resin. 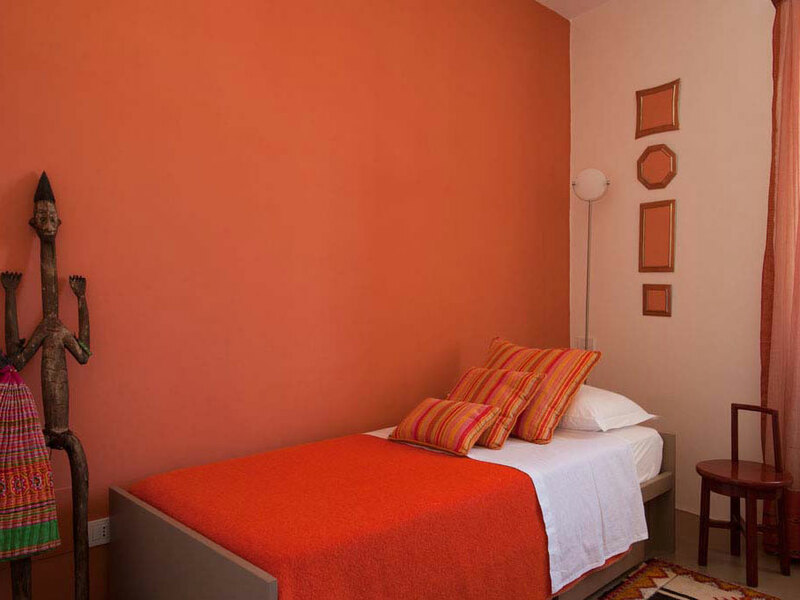 The accent colour is Hermes orange: cheerful and chic. 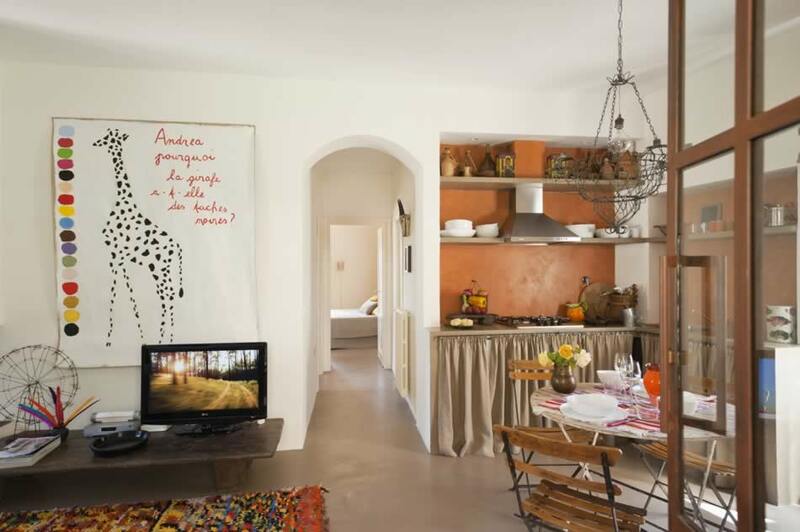 An arched doorway leads to the two bedrooms and the bathroom. 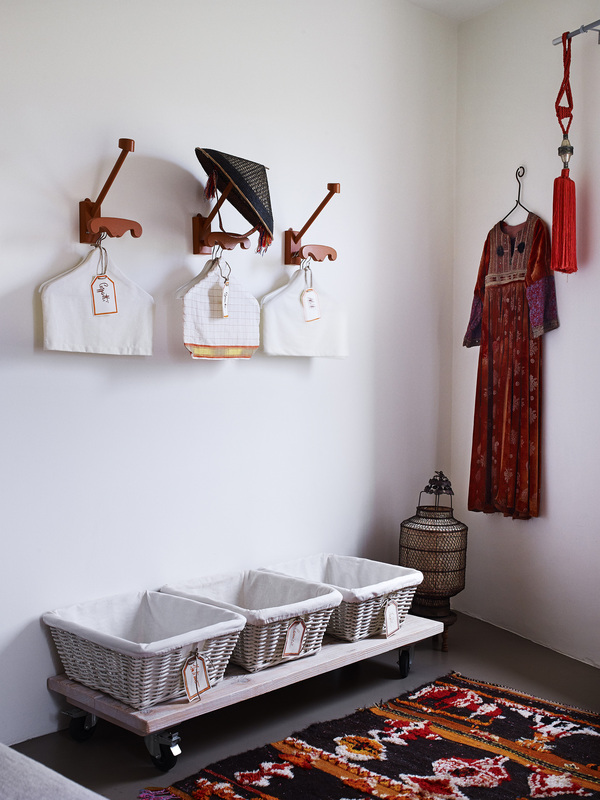 The clothes hooks were recreated from an old design and below them are linen-lined baskets for clothes. 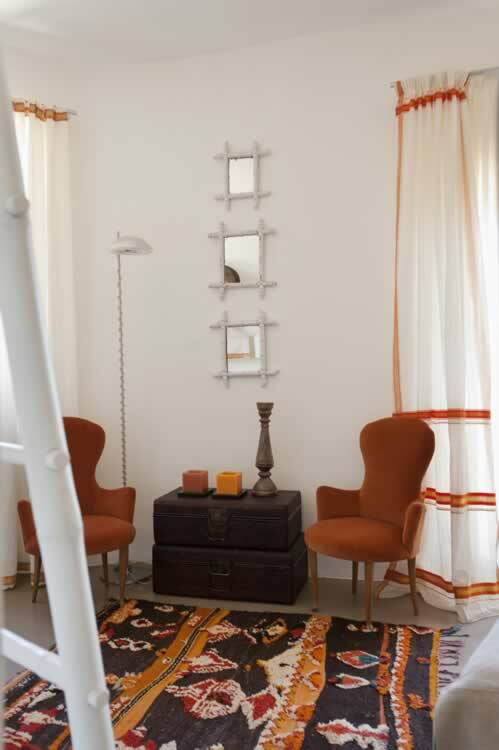 The red curtains go hand in hand with the Moroccan rug and the vintage velvet chairs. 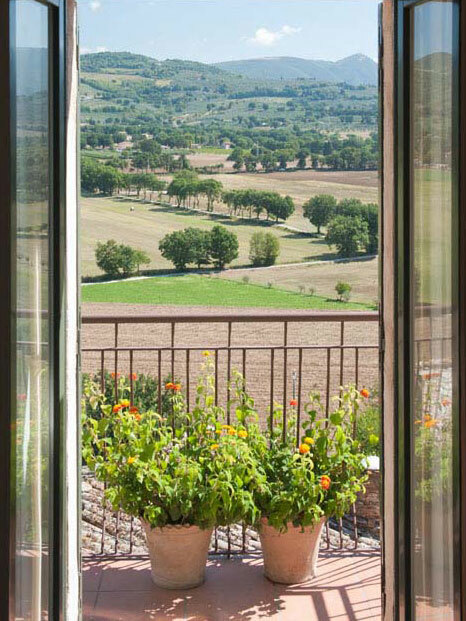 Open the window blinds onto a breathtaking view over farmlands and hills. 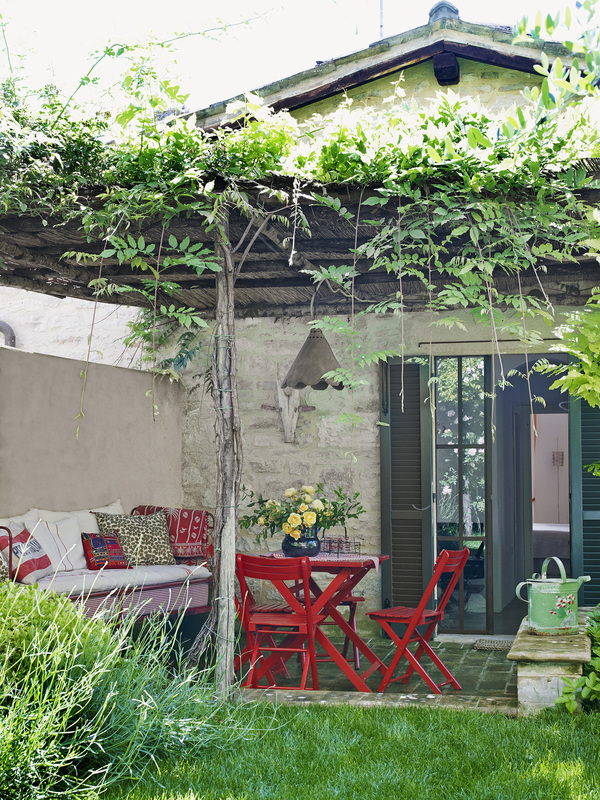 Nothing of the modern world is to be seen from this romantic retreat – only Italian landscape at its very best. 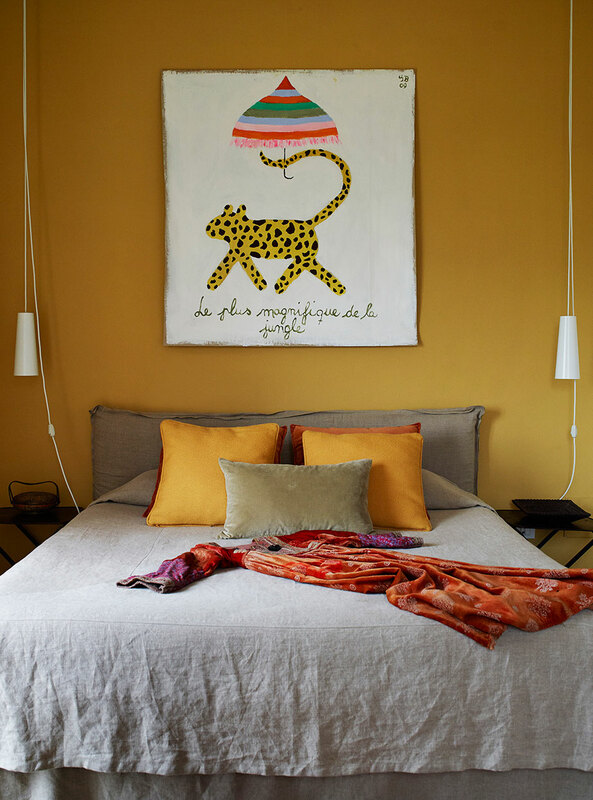 The orange-and-white second bedroom is fresh and bright, smaller but not tiny. 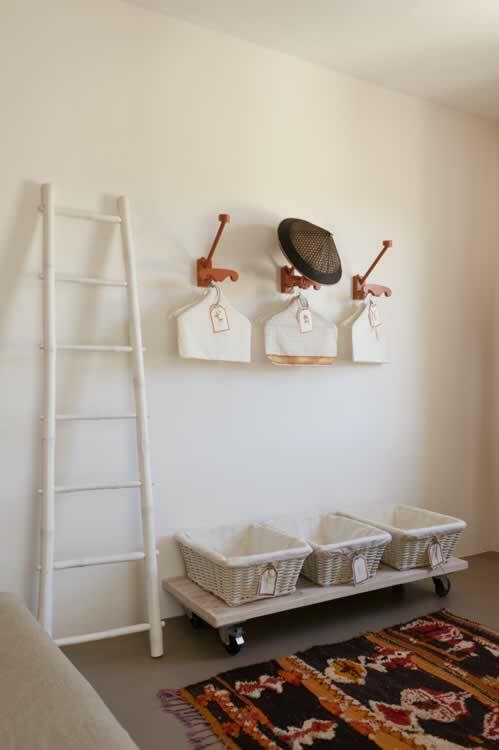 There are hooks and baskets for your clothes. 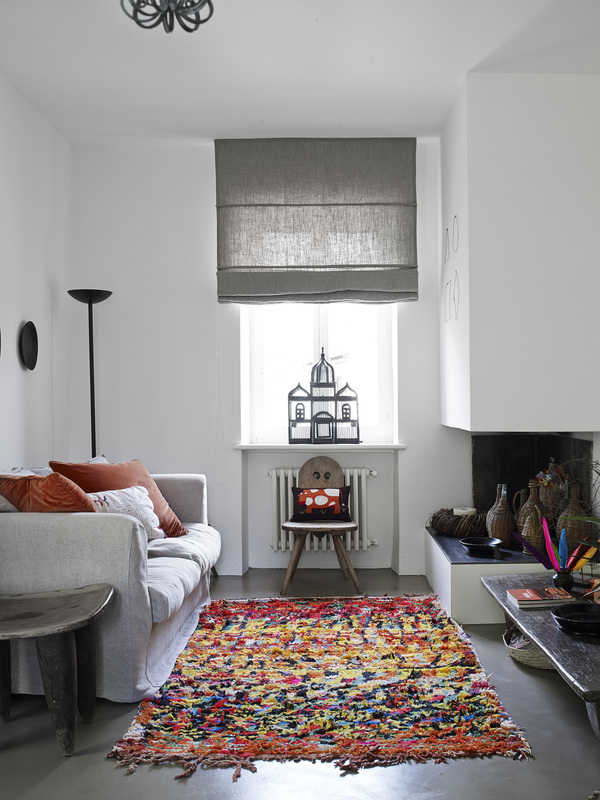 A cosy Tyrol blanket adds texture. 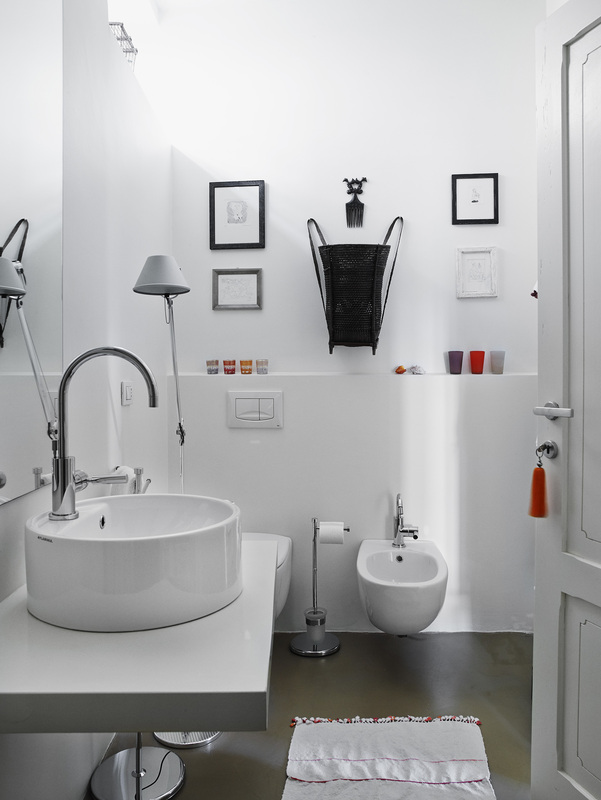 The bedrooms share a modern bathroom. 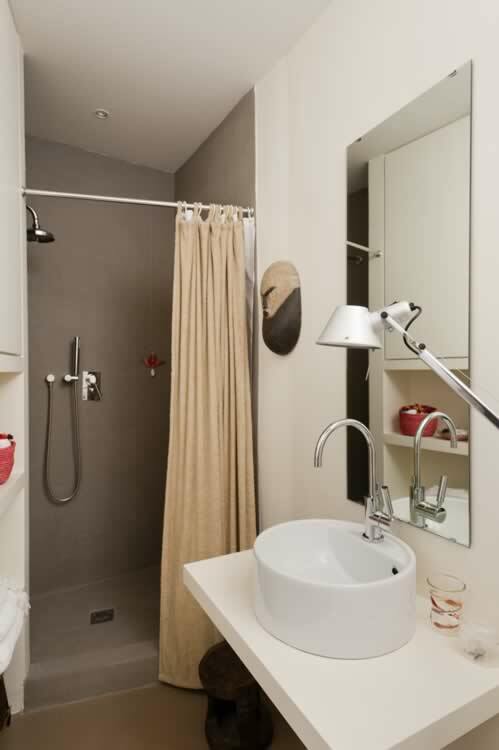 Large shower, good directional lighting and an oversized heated towel rail make your morning routine a delight. 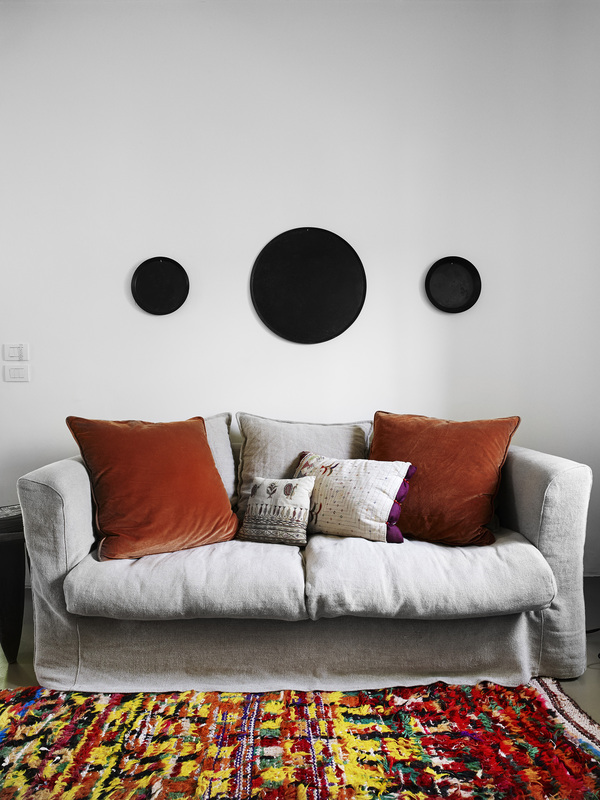 – Living area: kitchen and dining area, and a three-seater sofa opposite the fireplace. Air Conditioning. A doorway leads to the two bedrooms and bathroom. 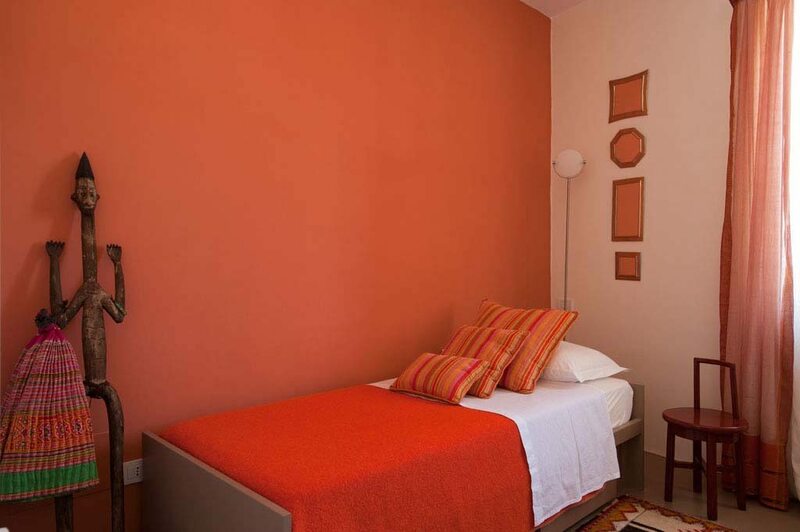 – Master bedroom: king-size bed, air conditioning, and balcony with a fantastic view of the Umbrian Landscape. – China’s Room: small but cosy room with a single bed, ideal for a single person or as a children’s room. Air conditioning. Baby cot available. 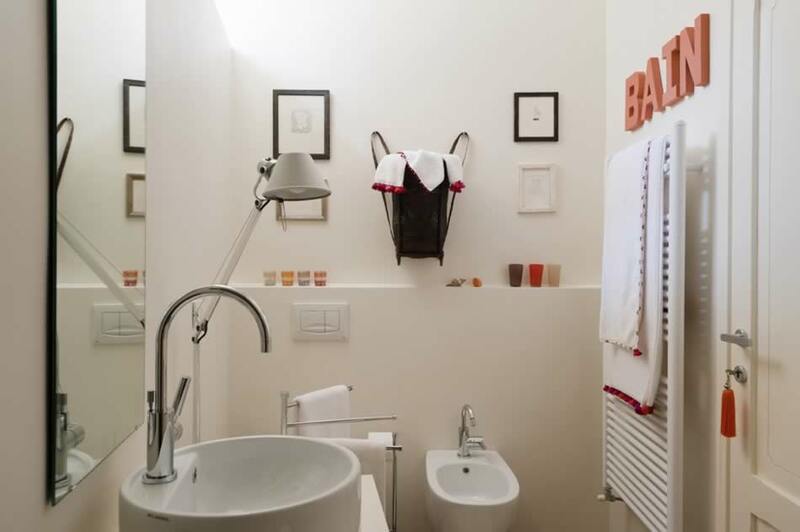 – Luxury shared bathroom with rain shower. 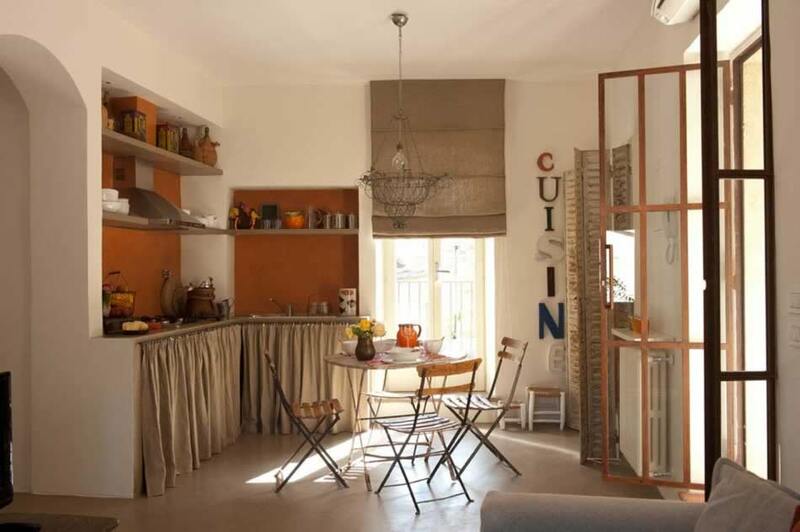 – Portico, dining table for 4, and direct access to the kitchen and living room. 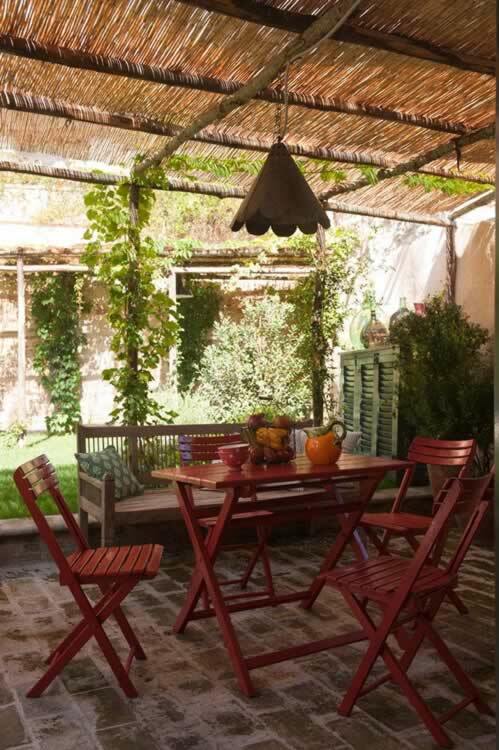 – Perfectly maintained garden with a lovely pergola and comfortable loungers. – Extra maid service and more.